BEIJING, Jan. 11 (Xinhua) -- Xi Jinping, general secretary of the Communist Party of China (CPC) Central Committee, on Thursday called for more anti-corruption efforts to "fundamentally improve the political ecosystem of the Party." 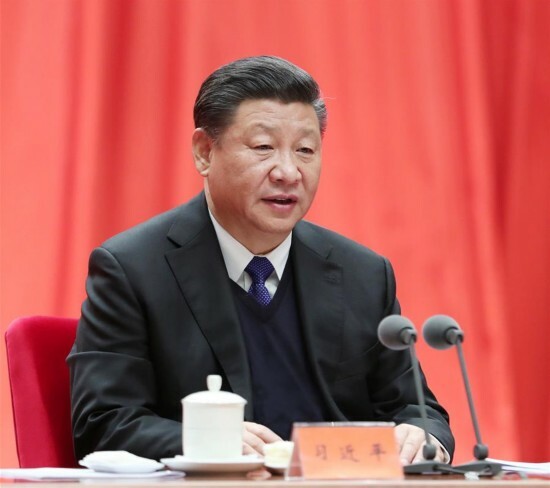 Xi, also Chinese president and chairman of the Central Military Commission, made the remarks at the second plenary session of the 19th Central Commission for Discipline Inspection (CCDI) of the CPC. "All-round efforts should see the Party's political building enhanced, its theory strengthened, its organizations consolidated, its conduct improved, and its discipline enforced, with institution building incorporated into every aspect of Party building," Xi said. "Socialism with Chinese characteristics has entered a new era, and the CPC's leadership is a must for the country to advance its great cause." Xi said that "the Party itself and its members have gone through essential and profound changes," which required higher quality of Party management and enhanced political and organizational functions of Party organs. "We should push forward the campaign with heroism, and takes the bull by the horns with a fighting spirit that never steps aside in face of an enemy," he said. "Senior Party members should be subject to higher and more rigorous standards and placed under tighter scrutiny, though all Party members should follow the rules," he said. Noting that senior officials should fulfill their duties fully and responsibly, Xi stressed that they should show strong commitment in bearing their political responsibilities and will be held accountable if failing them. Xi asked CPC officials to remain loyal to the Party "at any time, and under any circumstance." Xi said Party officials should "always be reliable, align themselves to the Party's central leadership in thinking and deeds, follow the Party's instructions and fulfil their responsibilities." "Decisions and plans made by the CPC Central Committee should be implemented in full, by each and every Party organization," Xi said. Xi warned against the resurfacing of undesirable work styles -- formalities for formalities' sake, bureaucratism, hedonism and extravagance. He demanded close monitoring to spot hedonism and extravagance in new forms and asked heads of Party committees and governments at each level to assume overall responsibility for correcting the behaviors of formalities for formalities' sake and bureaucratism. To maintain close ties with the people, Xi said Party officials should "resolutely oppose privilege-seeking and work with and among the people to resolve their pressing concerns." Xi required measures to address both the symptoms and root causes of corruption to secure a "sweeping victory in the fight against corruption." "Measures targeting the root causes must be consolidated while those to cure the symptoms must be vigorously wielded," Xi said. He said strict Party governance should be expanded to the grassroots level and work should be done together with the crackdown on gang crime to uproot both the gangs and the "protective umbrellas" above them. He also called for more international cooperation in the anti-corruption field. "Those who work in disciplinary agencies must discipline themselves first," Xi stressed. He urged all discipline inspection and supervision organs to follow higher standards and stricter discipline, and called on their staff to be loyal, resolute, responsible and maintain discipline and law, ensuring that the power bestowed by the Party and the people would not be abused. Members of the Standing Committee of the Political Bureau of the CPC Central Committee Li Zhanshu, Wang Yang, Wang Huning and Han Zheng also attended the plenary session. Zhao Leji, head of the CCDI and member of the Standing Committee of the Political Bureau of the CPC Central Committee, presided over the conference and delivered a work report on behalf of the CCDI standing committee.